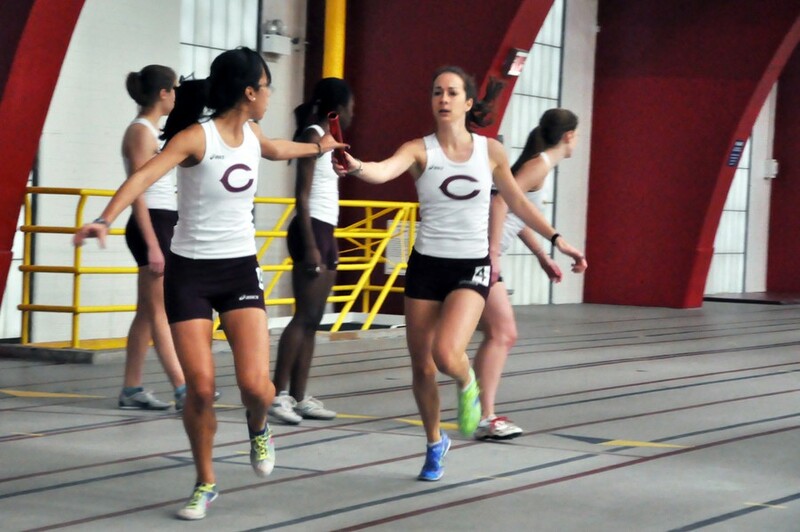 Two separate days of competition for the men and women yielded two very different results for the Maroons’ squads this past weekend. At the Leonard “Squig” Converse Invitational in Whitewater, WI, the women placed third in their highly competitive field, while the men took seventh. Of the eight teams facing the women, three were ranked in the nation’s top 25. The men competed in a field of nine teams, four of which sat in the top 25. The women scored 82 points en route to their third-place finish. Currently ranked 49th in the nation, they upset 17th-ranked North Central College (IL), which scored 76 points, by a margin of six. They also overcame Augustana (72), St. Norbert (59), Wisconsin (50), and Loras (35). UW–Oshkosh and UW–Whitewater took first and second, respectively, with scores of 169 and 117. Oshkosh still holds the number-one ranking in the nation. A talented newcomer to the team, Askins-Gast raced thrice for the Maroons at Whitewater. She placed seventh in the 400-meter dash with a time of 1:01.14, losing to first-place finisher Beth Dreikosen of Whitewater by less than two seconds. Askins-Gast also competed in two relays for the South Siders. With her finishes in those three events, she helped contribute six points to the Maroons’ final score. The men, ranked 52nd, had a bit more difficulty, managing only 38 points—well behind first-place North Central College, which tallied 142 points. The Cardinals were followed by UW–Oshkosh (110), UW–Whitewater (104), UW–La Crosse (96.5), Augustana (66.5), and Wisconsin (62). The Maroons finished ahead of Loras (18) and UW–Platteville (7). Considering that the top-four finishing teams rank as the best four teams in the nation, the Maroons were not disappointed with their finish. But they know they need to improve. Zalov was the top Maroon in the mile run with a fourth-place finish (4:22.27). UW–Whitewater’s Dawson Miller secured first place with his time of 4:16.82. Miller’s time currently ranks 17th in DIII. Zalov’s finish contributed five points to the South Siders’ final tally. Other notable performances included first-place finishes from fourth-years Julia Sizek (5000m run) and Kayla McDonald (800m run). Third-years Sarah Peluse (5000-meter run) and Elise Wummer (mile run) also raced well, finishing second in their respective events. On the men’s side, fourth-years Billy Whitmore (5000m run), Dee Brizzolara (200m dash), and Gregor Siegmund (3000m run) finished second, third, and third, in their respective events. Later this week, the Maroons will face off against the best of Chicago in the Chicagolands meet at Henry Crown. There, they will face numerous DI schools as well as—once again—North Central College.